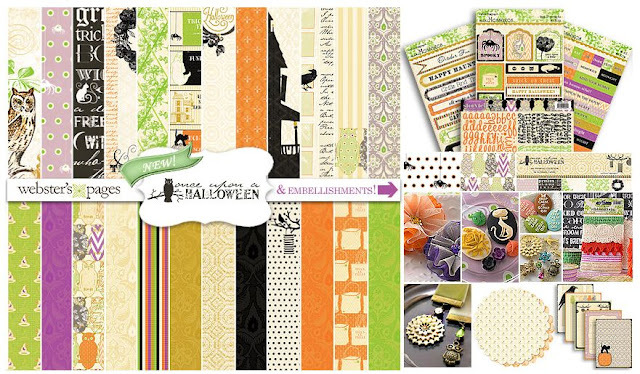 Erin Blegen: My Scrap Cabin: Webster's Pages "Trick or Treat" Blog Hop!! 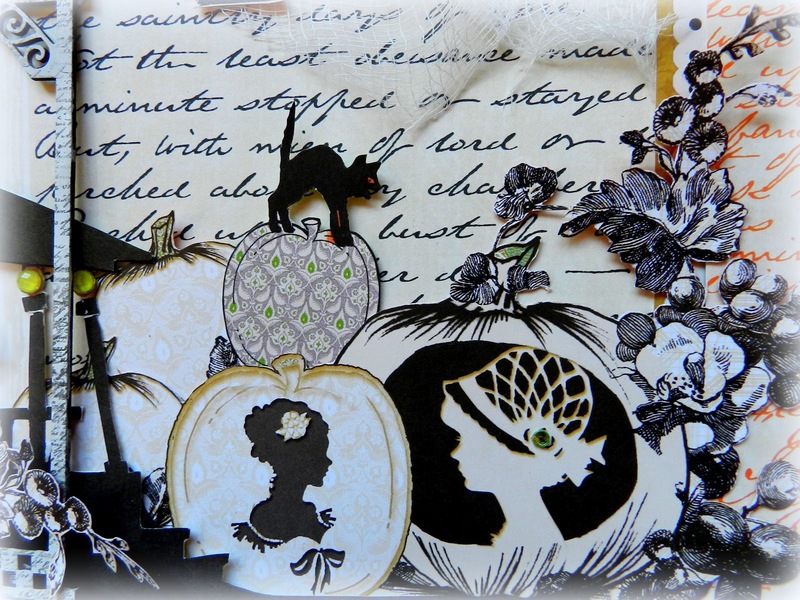 Hi everyone and welcome to the Webster's Pages "Trick or Treat" Blog Hop!! If you've arrived here from Diana's blog, then you're right on track! If not, head back to the beginning of the hop HERE at the Webster's Pages blog :). Why? Because there are SEVEN mystery prizes hidden amongst the blogs along the way- and the only way you can make sure you're in the running to win is to leave a comment at EVERY blog along the hop!! I hope you've enjoyed all the amazing ideas thus far for inspiring your own "handmade Halloween", and I assure you- there's much more to come!! We're celebrating this spookiest of holidays with the fabulous "Once Upon A Halloween" collection from Webster's Pages~ and let me tell you, it's been a real TREAT (hee hee) designing with this range. And for this very special event, I put together a fun "Halloween scene" layout. I fussy cut the house and then layered it over the windows. Of course this house needed to be brought to "life" to suit my spooky scene. 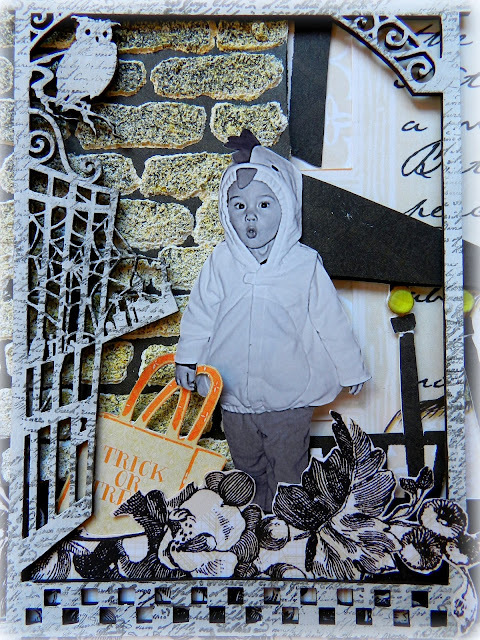 I wanted it to be a bit grungy and scary- one that might entice the "spooked" look on my little guy's face! So I used some texture paste and a brick mask for the wall, which I then sprayed with a bit of orange and black mist. Then with a small circle punch I punched away at the "Lantern Light" paper before snipping in half and layering over my rooftop. Thanks so very much for visiting my blog and taking a look at my project :). I hope I've added to the inspiration today and encouraged you to keep on going~ Your next stop is the gorgeous and talented Tomoko Takahashi~ I'm certain you'll be blown away by what she's created just for you :D~ Happy Hopping and Good Luck~!! Your little one looks incredible in this elaborate layout. I can't believe how you staged it!! Looks fantastic. Ooh, this looks gorgeous, Erin! So love the cute little scenery you created for this photo of your son. The lanterns are so pretty! Erin, your layout is really great! I love how you captured the holiday. Oh, and I love the pic inside the haunted house....it looks so real!! O.O I. am. stunned. I don't know how it is even humanly possible to fussy cut such intricate pieces! Your LO is absolutely phenomenal... I just found myself sitting here staring at it for an eternity and I still don't know that I caught all the detailed work you put into it! LOVELY! I Looooooooove it! The roof is soooo cute! 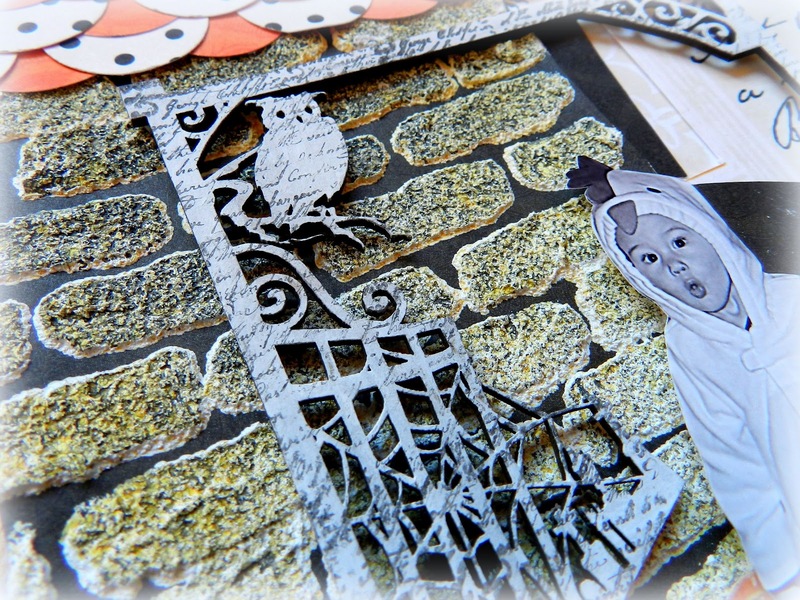 Oh, fussy cutting is my weakness, I like what you did! Ooohhh! So much detailed work! I do believe you spent a lot of time in fussy cutting... But it really worth when I see how you brought your layout to life! Hvor er du dygtig, det er det mest kreative og fine LO jeg længe har set, det må have taget meget lang tid at sætte sammen, man kan blive ved at finde nye detaljer, flot flot. knus morkaren. Wow, love how u did the brick wall of the hunted house! Thank you for sharing! Oh Erin just beautiful as always! This is so cool erin! Love it! Very creative layout Erin! Love it all. The photo is too cute for words. Wow! Love all of the details!! Love love love this! So darn creative, and thanks for sharing your tips. Your blog is amazing. i absolutely LOVE how you fussy cut everything, even the photo! And that roof made out of the circle punch is just amazing! WOW! LOVE this!!!! It is so beautiful. All the details are stunning. Wow! Amazing details and fussy cutting! Love that you fussy cut the kiddo too! I LOVE LOVE this layout, it is gorgeous. As always your work is such an inspiration and great read. Thanks for the comments on how you achieved this fab look, will be giving this one a go! I would pick my fav bit but i love it all! ok, this is my FAVE page of yours, omg soooo cute! looks like a story book illustration, love it!! great colors on the brick wall, the whole page is telling a complete halloween story!!! Awesome page! Love how you created a scene. Fab texture on that wall and wonderful use of gauze! TFS! That rooftop is awesome - so cute! Love the use of product. You must have the patience of a saint to do all that fussy cuting. This is AMAZING, so much detail to look at! Really really wonderfully done! Love it! Fantastic page! I love all the layers. Thanks for the inspiration! Thanks for a fun blog hop and all the inspiration along the way! WOW, lots of great techniques! LOVE that house! Great work! 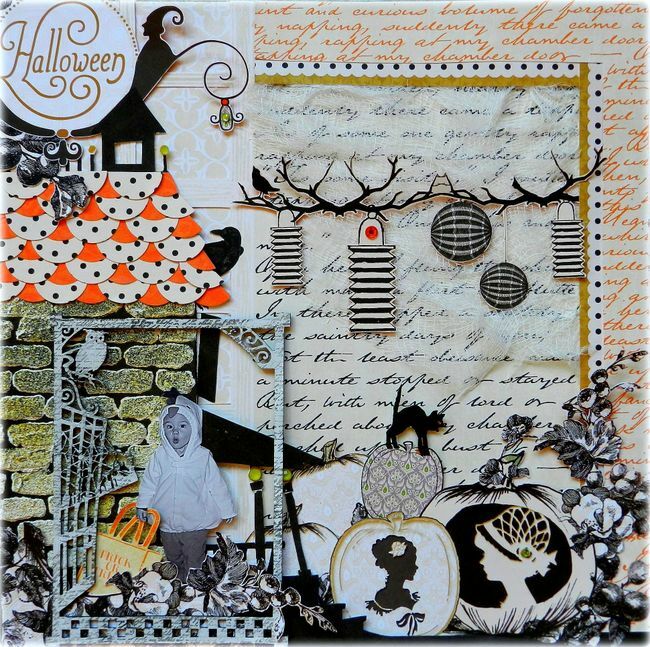 Such an elaborate scene, so perfect for halloween!! Well-done! My goodness, what a terrific Hallowen layout. It's spooktacular! Trick or Treat! This is stunning! I held my breath in a moment! Thank you for sharing this and your technique. Amazing Halloween scene Erin. His expression is fantastic!! Wow! All that cutting made one amazing layout! Amazing layout Erin, love all the fussy cutting and gorgeous brick wall, not to mention one cute little guy!! Great job! 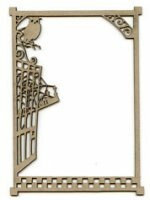 What an intricate LO! Just gorgeous! O so lovely! Just loving these papers and your design! wow Erin, I don't know how you do it! What you did to the house with the brick is awesome! Дорогая Эрин ! Ваша работа как всегда безупречна и неподражаема !!! Мне все нравится , что вы делаете . OHH Erin... You are just so super talented.. Your work so captivating and knocks you over with talent!!! I LOVE the layout.. so perfectly made.. with such awesome details. I'm so impressed!!! what a great layout.. Love those lanterns. WOW! You really made my jaw drop....lol, you're super talented lady! I' m so inlve With all of your LO. You really inspired me a lot. Thank you so much for sharing fabulous layout like this. Awesome page! I love the cobblestone and the shingle roof! Erin as always your work is stunning!!! The amount of detail you put in just makes me not want to look away! its just stunning! love everything... you always create such interesting and gorgeous details! wow Erin! So many gorgeous details in this layout! Your artwork always amazes me! Thanks for the inspiration! WOW. with just orange, black and white, the layout is fantastic! Amazing Erin! Loving all of the details! I love the detail in your super cute layout. Wow ! This is awesome! That picture is too cute! Gosh where do I begin, there is just SO much eye candy here that I am awestruck! Love love love this! Thanks for sharing !! This is the most amazing layout and still doable. Wow! There are just so many great details in this scene. The 3-D effect of the gate and the shingles are amazing!! Thanks so much for the inspiration!! 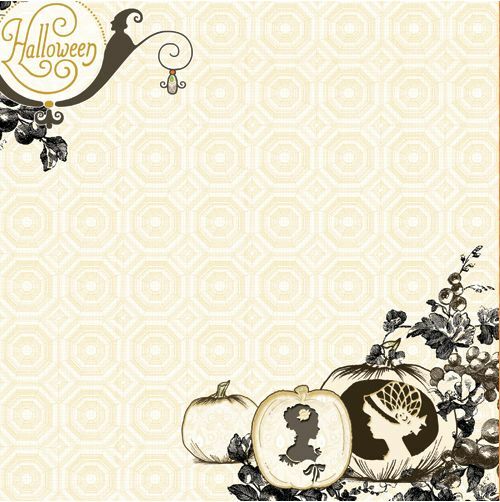 LOVE that Halloween frame! So, so pretty! Looks like a lot of work, but worth it! Love this fun little LO! Great photo cutout and the scene you created for him is the best! What an awesome page Erin!!! LOVE the frame around the photo and the pops of orange in the "roof tiles" and the hanging lanterns are really fabulous!! love all your detailing and how you used the branch! Freakin' amazing!!!! I really love all the creativity that went into this! 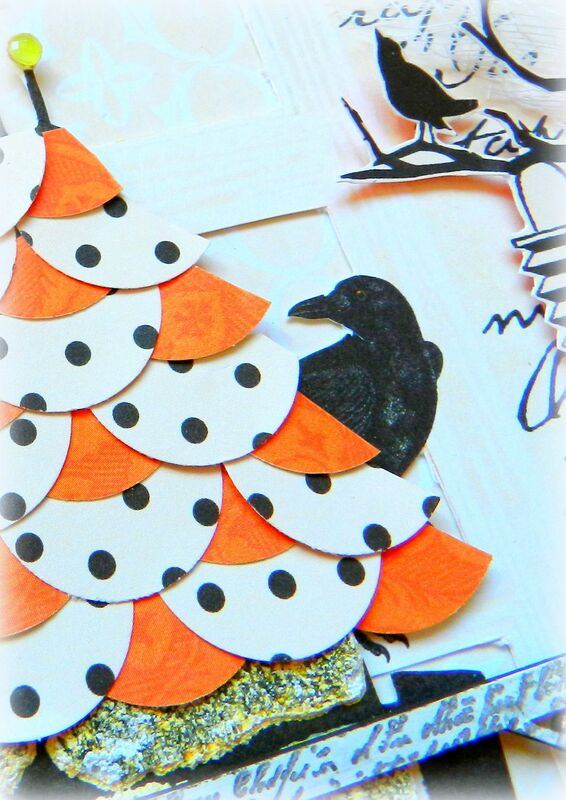 Black cats, owls and crows - oh my! I just love the 3-D effect of this layout. The design of circles on the roof as shingles is awesome and I love the little trick or treaters bag that she's carrying. And the autumn leaves all around the gate really seals it. The cameos pumpkins are just out of this world. A nice twist. Thanks for sharing! Wow what a completely fabulous layout Erin! OH WOW!! What a fun and original layout! I love the way you set it up as a scene! The way toy use webster's collections is amazing!! Beautiful as always. Thanks for sharing. OMG! I love it! so great idea to combine photo with cut-outs!!! Love-love-love! I follow your blog & have to tell you how impressed I am with the number of LOs you're able to get done. And the LOs are so complicated that they have to take quite a bit of time. I don't know how you get it all done! Don't you just love the moon hidden with the lady image , i do . Your roof layers are fab too! I love your Lay out!So creative! LOVE, LOVE, LOVE your page! SO much detail, right down to the trick or treat bag! Thanks for the chance to win free stuff! This is absolutely adorable and SO clever!!! Your page is just stunning! All those details are amazing! I love this page and all the details. Awesome! This page is gorgeous! The details make it so interesting....you eyes can concentrate on the whole page and then move to each special design element. Oh my gosh ... I LOVE this page! Thanks for sharing the details of how you created it!! Wow, that is so gorgeous! It must have took you hours to do all that fussy cutting. I especially love the circles and the lanterns hanging from the branch. This is my fave so far!!!!!!!!! OMG ! I LOVE this LO ! what a great idea. Totally spooky. Oh my!! What's not to love about this?! I'm just stunned at that house (roof/bricks), the cute way you added the paper bag to the trick or treater, the script paper, the branch and lanterns.. all of it is simple amazing! Love,Love,Love this LO! All the fussy cutting is amazing! TFS! Your LO is amazing! I love how the bling just stands out like little lights all over - it has a fabulous effect! Thanks so much for sharing!!! Wonderful layout. Love all the detailed elements. Beautiful layout. I love the Halloween tree. Thanks for a chance to win. What a cool layout! Love all the texture, and the roof looks amazing! This really is brilliant. I wish I could see product through your eyes. Love love love this LO. It reeks of Halloween goodies! I love the idea , you made the rooftop used circle punch. Your texture technique on the wall is so great! Funny little scene ! Well done ! I go on hopping (and hoping) ! Wow - what an amazing layout! So detailed and awesome!